Description Designed for installation in pump discharge piping where it performs triple duty. It acts as a spring loaded silent check valve, a shutoff valve, and a balancing valve. Used in conjunction with the Mueller Steam Specialty suction diffuser, it constitutes a compact and effective complete pump protection and isolation package. 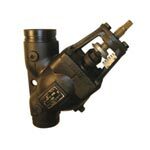 Description Designed for installation in pump discharge grooved end piping systems where it performs triple duty. 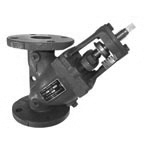 It acts as a spring loaded silent check valve, a shutoff valve, and a balancing valve. Used in conjunction with a Mueller Steam Specialty suction diffuser, it constitutes a compact and effective complete pump protection and isolation package.